A real world family is trying to drive to Wild Waldo's One Of A Kind Amusement Park. However, theyaccidentally enter a warp zone and crash into the Mushroom Kingdom. While they try to fix the car and figure out where they are, a young Mushroomer sees them and believes that they are aliens. He frantically begins warning everyone he comes into contact with, who then warn others making the story get wilder and crazier with each telling. Even King Koopa and the Koopalings hear these stories and are believing them to be true. Mario and Luigi know better and set out to help the family return home. 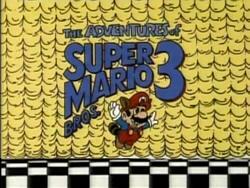 The only problem however is that King Koopa is determined to destroy these so-called aliens out of fear.